Just as for JBoss Seam, some validation of Spring XML files can take time, but I find that it doesn't crush Windows the way Seam files seem to. What it does to Linux I don't yet know as all my Seam work and my Spring training has been on Windows so far. I think this "easiness" is because Spring limits itself mostly to Java, XML and usually fairly light JSPs. Of course, I'm a beginner and what do I know? 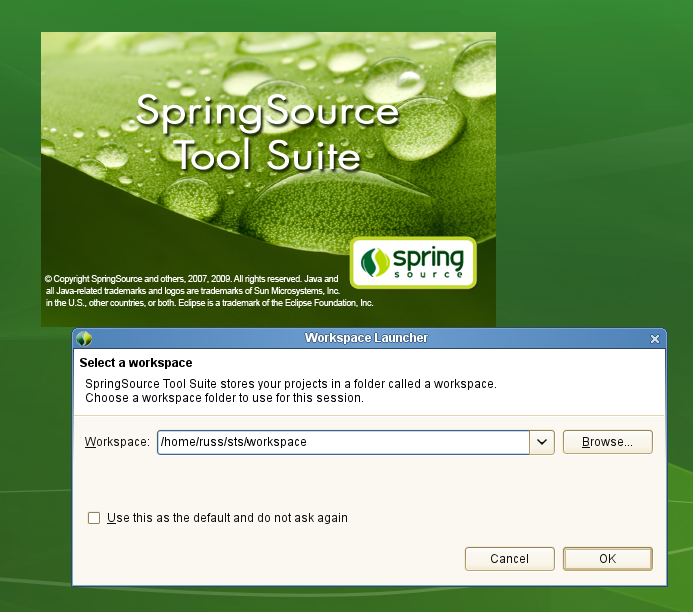 Go to http://www.springsource.com/products/eclipse-downloads and pick to download the SpringSource Tool Suite 2.1.0.SR01 (Win32, Linux, etc.) This download, though the page offers you separate Eclipse models, should contain everything you need. Of course, by the time you read this, the version may no longer be 2.1.0SR01. Interestingly, my Spring Core Framework training in San Francisco did not take us through this installation. Instead, we received thumbdrives with all the software already in place. I forgot to press for help installing on Linux and so have had to spend some time figuring out how to do it. Nota bene: You cannot convert, enhance or otherwise "upgrade" a normal Eclipse installation to endow it with the SpringSource Tool Suite. I was unable to do it, others don't seem to be able to and I found independent comments not to try it here and there on the web. Downloading the SpringSource Tool Suite to my Linux host, despite my Firefox settings, I found it on /tmp instead of in my download directory (which I expected to choose interactively). This sometimes happens on Linux and is a function of the web site. What happens is probably similar in many respects to Windows, but I'm going to detail the Linux experience only. Some points are obviously Linux-only, but this will be clear to any Windows user and it will be abundantly clear what to do for that platform. For want of spending more time cogitating this, I decided to put the downloaded script on /home/russ/sts and direct the SpringSource installer in the next step to put the tool suite on /home/russ/springsource, which it suggests itself—knowing that I'll regret this later. ...and I chose jdk1.6.0_12 naturally. Ignore the awkward instruction about how what you choose must be a JDK after you've chosen it. The installer won't actually know what it is until later and it's just being stupid at this point (not looking to see if in fact it is a JDK and then retracting the distubing message). Eventually, choosing to launch the tool suite, you'll see an Eclipse launch splash like this one. Create your first workspace. Remember, at this point, we've used no Eclipse software from eclipse.org or from the Spring download site. 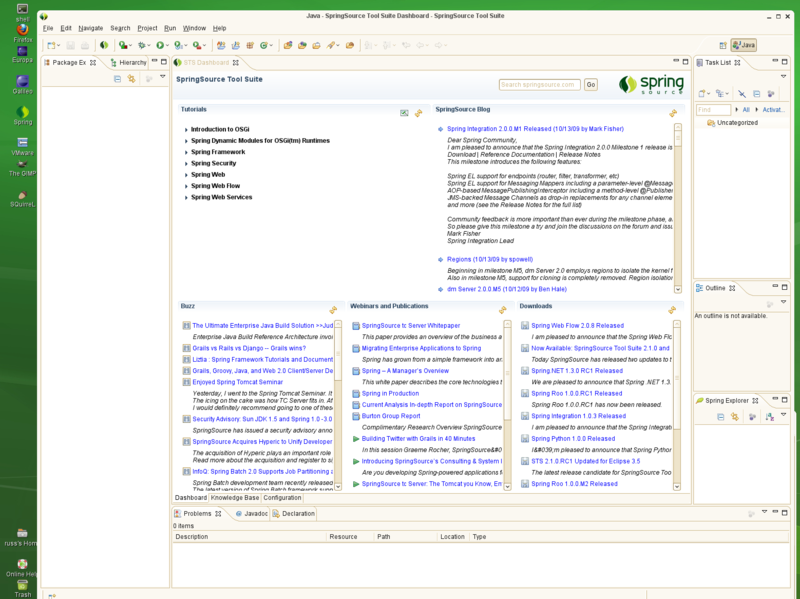 ...you will get the Eclipse workbench you are looking for with, in the Editor Pane, the SpringSource Tool Suite dashboard, an informational page you may wish to dismiss (for you can easily restore it by bouncing Eclipse or getting it from the Help menu). Create a launcher for STS, name it "Spring," and use /home/russ/springsource/sts-2.1.0.SR01/icon.xpm as the icon. Augment the launcher command line by adding -vmargs -Duser.name="Russell Bateman" to it. This will ensure that Javadoc authorship is accurately short-stroked in when you create new doc. Notice my Spring icon to the left. You are now ready to begin creating projects. You can close the Spring Dashboard since it's easy enough to re-open later if you want it. It mostly contains a gathering of RSS feeds relevant to Spring. Spring projects have a little S on them to distinguish them from Java projects, Dynamic Web Projects, etc. This is more of a private note since the Spring course materials are protected by NDA and only available to course subscribers. The materials passed out in class included Windows and Macintosh coverage only. I got the Linux installation file(s) later. On my first attempt to import saved class projects into STS, I met with failure as reproductions of an e-mailed exchanges between me and the instructor demonstrates. These exchanges were instructive. get a perfect environment up without the installer; that's why we ship it. Do you still have those materials? latest-and-greatest STS you just downloaded. > POM problem that will fix itself once Maven is healthy? > materialized this "folder" in our classroom that isn't in STS as it ships? > has the same problems. days or more before it's done, however. week, please email me again. > installer is an .exe. On the 29th, he sent me Linux (32- and 64-bit) installer files. I tried the new file out and had this to say. He interleaves comments. > but I can't know what is relevant, so here goes. > in working with Spring. Good to know; I'll fix that for future versions. > using subdirectoy springsource already). >     of Maven core plugins are useing jars from the JDK. >     that Installed JREs are also using JDK installs. you will get the warnings from the Maven tooling. > selected that as my default (or "checked" JRE). installation. However, if you're up and running at this point, don't sweat it. >         it's duplicate phase, specified in its plugin descriptor. > understand what it's saying, I don't understand what, if anything, to do about it. > executables, though there are no compilation errors. all benign. You can ignore them. > courseware core-spring-2.0.1.RELEASE-installer.sh you just sent). ...because there are too many repositories to handle when using Spring. And, Maven has got real problems with repositories. For instance, Sun's contributions may not be consumed directly since their JARs require an interactive EULA acceptance when accessed (off the web, that is). Here's what I did to overcome these nightmares. This is tempting—create interface elements using FLEX, but use Spring to do all the hard work. Use Granite Data Services as a sort of confluence to tie FLEX to the world of JEE.